#01 Kant: What is Enlightenment? 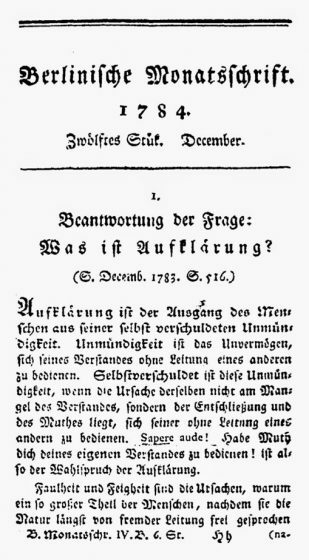 The reading for our first meeting on 13 November 2015 is a journal article published in 1784 by Immanuel Kant, titled An Answer to the Question: What is Enlightenment? This short article addresses the topics of autonomy and critique, founding concepts of the Enlightenment, which continue to shape our understanding of individual freedom and the role of art in society. Please read the text and bring it with you to the meeting, along with your questions or comments. DOWNLOAD: Kant, Immanuel (1784). An Answer to the Question What Is Enlightenment? Berlinische Monatsschrift. Dec 1784, pp. 481-494. First page of An Answer to the Question: What is Enlightenment by Immanuel Kant, Berlinische Monatsschrift. Dec 1784, pp. 481-494. Kant’s article An Answer to the Question: What Is Enlightenment? 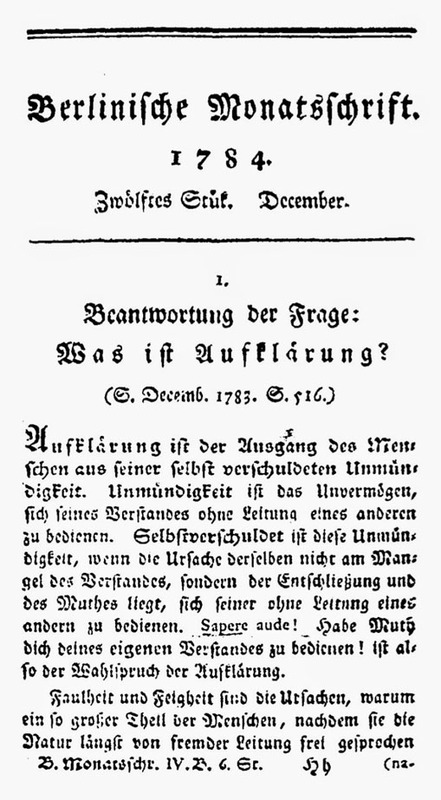 was published in Berlinische Monatsschrift (an Enlightenment journal) in December 1784. It was one of many responses to a question in an article the previous year by Johann Friedrich Zollner. Zollner railed against the institution of civil marriage, an idea suggested in an earlier article by the journal’s editor Johann Erich Biester (September 1782). Biester claimed that associating marriage with religion was contrary to Enlightenment ideals. Zollner argued that marriage required the stability that only religion could provide. The very foundations of morality were being shaken, Zollner wrote, and cautioned against “confusing the hearts and minds of the people in the name of Enlightenment” (Steve Naragon and JF Zollner quoted in Kant, Immanuel (2013/1784). Beantwortung der Frage: Was ist Aufklärung? Trans and notes Daniel Fidel Ferrer. Creative Commons General Public License Attribution, Non-Commercial, version 3.0). Foucault, Michel (1984). What is Enlightenment? In The Foucault Reader, Paul Rabinow ed. New York: Pantheon, pp. 32-50. Foucault, Michel (2007/1979). What is Critique? In The Politics of Truth, intro John Rajchman, Sylvere Lotringer ed. Los Angeles: Semiotext(e), pp. 41-81. Butler, Judith (2002). What is Critique? An Essay on Foucault’s Virtue. In The Political, David Ingram ed. Boston: Blackwell, pp. 212–228. Adorno, Theodor & Max Horkheimer (2002/1947). Dialectic of Enlightenment. Philosophical Fragments. Trans Edmund Jephcott, Gunzelin Schmid Noerr ed. Stanford: Stanford University Press.